People are very good at looking past things that are irrelevant to them, and you have probably looked past a good many retaining walls in your time. Recently, something may have brought retaining walls to your attention as a practicality, or perhaps a great-looking new retaining wall in your neighborhood has you thinking about one as a design feature. Retaining walls are attractive and practical pieces of landscaping that can fit into many yard designs. A retaining wall is a structural feature that holds back a sloping patch of soil. Instead of long, natural inclines, retaining walls allow flat areas to step up to sloping areas without mixing the two. They are made from a variety of different materials and can range in height from a few inches to several feet. Retaining walls can come in a variety of appearances and designs, as well as heights. They do not have to be straight, and a curved wall can be a very attractive option for some landscapes. Most are under four feet high because walls taller than this typically require designing by an engineer and may require permits. 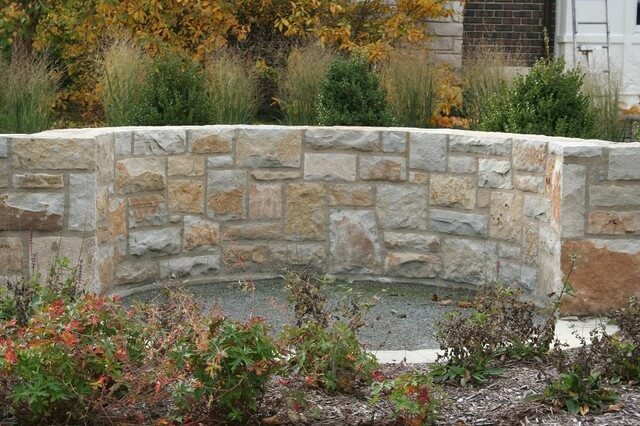 Sometimes, retaining walls meld into other landscaping features such as ponds or fountains. The same material that is used to make a retaining wall can be used to build up the outside containment of a water feature, or an above-ground planter bed. This type of retaining wall is usually placed during a large-scale landscaping redesign. However, if your yard already has existing landscaping and you do not want to perform a major overhaul, the variety of options available means that there is at least one type of retaining wall that will fit in nicely. The pressure of soil against a wall is not inconsiderable, so a retaining wall needs to work in a sophisticated way. There are several parts to how a retaining wall works, and some of them are quite technical. Basically, a retaining wall needs to be strong enough to hold back the soil that would not remain sloped if the wall was not there. This wedge of soil immediately behind the wall is what would give in to gravity and fall down the slope if the wall were not there. The rest of the soil would normally remain in place, as a natural slope. The one exception to this would be a natural disaster such as an earthquake, when a retaining wall might have to hold up to considerably more pressure. Retaining walls are usually built at a slight inward lean so that pressure from the soil does not cause them to lean outward. They must be carefully designed in order to prevent water from backing up behind them, as this will create pressure and may damage the wall. Some designs incorporate more sophisticated drains than others, but all of them require some form of drainage. There are two major reasons that you might need a retaining wall: either to create more usable space or to prevent a hillside from losing soil. 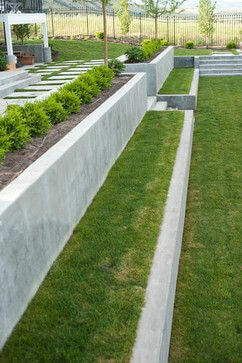 Flat spaces made by using retaining walls can be great places to garden, put in a patio, or just hang out in the yard. If you have a yard that has very little usable flat space, a retaining wall might offer you the option of creating and maintaining an area without a slope. Erosion of hillside soil can be a problem in a number of ways, especially when you’re in mountainous territory. It may wash onto the lower-lying areas around your home, covering your yard in dirt. It can also affect the foundation of your home in extreme cases. A properly-built retaining wall can keep hillside soil in place and help prevent these problems. If your yard regularly gets covered with mud and soil during wet weather, a retaining wall will help prevent this. There are a number of options when it comes to materials for retaining walls. Some of the most common are wood, prefab concrete blocks, and natural stone. Other options include poured concrete, brick, and stone veneer. Wood and prefab concrete block walls are relatively easy to design and install, while natural stone retaining walls take more work and knowledge. 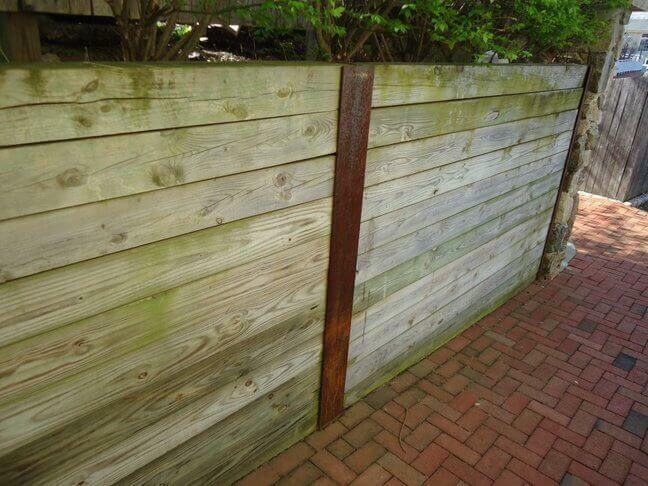 Wooden retaining walls are made from waterproofed planks or timbers, sometimes using rebar for support. Deadman anchors are used to hold taller walls to the slope and prevent bowing outward. Poured concrete is sometimes used to create a base that rebar is anchored in, before attaching the planks or logs. Poured concrete is a rigid wall made around a rebar frame. It forms a T-shape in the ground, with concrete and rebar extending forward and back of the wall underground. It must be poured into a frame which is made to be the negative of the desired style. Natural stone walls are made of rock either in its original shape or cut into blocks. Walls made from rock retaining its original shape are generally broken into two categories by size: rubble walls, and boulder walls. These walls typically do not use a base, although they may be laid on a layer of gravel. Although there are objective facts about retaining wall materials (stone is heavy, wood can rot), there is also a lot of personal taste involved in choosing one. Some people think that concrete is not attractive, while other people love the sleek, modern lines. Stone may be too heavy for some people to handle but not a problem for others. Logistics are also important because things like how the materials will get to you and how well your property drains will affect both the cost and the practicality of various materials. Natural stone laid in the dry stone manner is another durable option, with examples in Europe that are hundreds of years old. However, it must be done properly, or water getting into the wall will destroy it. It is also the most expensive. Wood is the least durable, but it is also the cheapest option, and even wooden walls may last twenty years. Poured concrete offers a nice balance of cost, durability, and strength.